Blogging Setbacks ~ How to Deal with them in 4 ways! 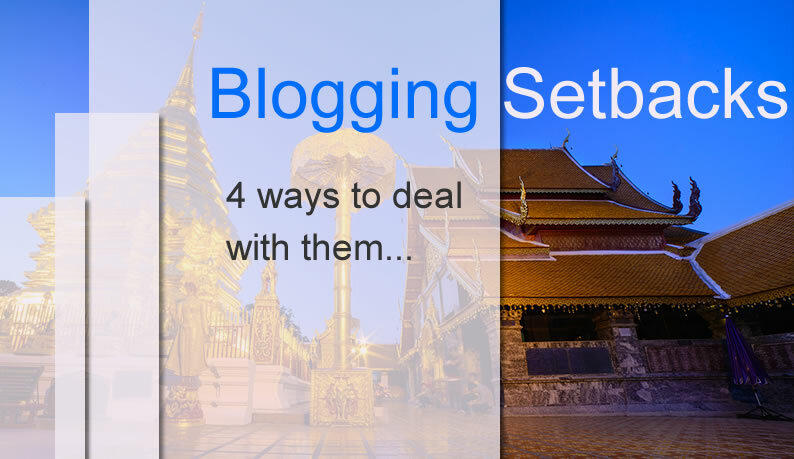 →Blogging Setbacks ~ How to Deal with them in 4 ways! I am writing these words from beautiful Chiang Mai, Thailand. Many people think I am lucky. I have circled the globe over the past 6 years as a pro blogger. But I am not lucky. I learned a lesson from happy, loving, successful people: people who live their dreams learned how to effectively deal with setbacks. If you are not living your blogging dream you simply quit after facing some setback. On the blogging front, you will face setbacks. Either you stop, or go forward. It’s that simple. I’ve followed a few basic tips over the years to deal with the rich collection of blogging setbacks I’ve faced while being a full time blogger and traveler. The worst way to approach a blogging setback is to fight or resist the feelings associated with the setback because whatever you fight, fights back. Or whatever you resist, persists. The best way to approach a disappointment is to embrace the sting. If you feel the negative emotions of suffering through failure you can clear the emotions quickly, helping you to feel better so you can take a fresh new perspective on the situation. Embrace the sting. Feel the pain. Feel the suffering of appearing to lose all of your traffic, or of losing your top client. Feeling the pain for a few seconds or minutes helps you clearly see the solution to the situation. Feeling the sting also helps you see that setbacks are illusions. We are always moving forward. If you slam into some obstacle, understand this: you allowed fear to dominate love in your being. Example; during a recent trip to Myanmar I had no internet access for 9 days. If I feared not being able to get online I’d have moaned and complained and worried about this horrible blogging setback. Since I chose to blog with love – versus blogging with fear – the setback vanished. I seized an opportunity to write offline and to enjoy my travels. Blog with love. Love never asks. Help people. Serve people. If you appear to face a setback, blogging with love dissolves the obstacle immediately. Slamming into disappointment proves you lost your way. Like a sheep who wandered from his shepherd, you shifted from doing what felt fun toward drudge word, or toward some blogging actions you thought you needed to do. If you blog mainly to have fun, the fun is the reward. Traffic is extra. Money is a bonus. If traffic or money doesn’t arrive, no big deal. They were just the icing on the cake, the cherry on top, not the cake itself. Every single one of my blogging setbacks happened when I stopped blogging mainly for fun. All my blogging disappointments dissolve when I blog mainly for fun, and care not much about outcomes. Blog for fun again. Purify your intent. Let go setbacks, disappointments and all those outcomes-based energies that make you feel crappy. I see a setback as a push forward. If you learn a lesson from the opportunity. Example; during some lean years online I only created content for my blog. Setback after setback besieged me, like a swarm of killer bees descending upon me. Traffic problems. Income problems. How do you deal with blogging setbacks? Get helpful blogging tips delivered to your inbox at Blogging From Paradise. It’s good to see you at Enstine’s. While blogging, people really dwell into a tragic condition having no traffic. It’s scary when blogger works hard and doesn’t get any result. I remember the days I used to strive for a few shares and comments. But it’s always about following your passion. Blogging is all about having fun. Having a focused mind always works at its best. Thanks for pointing these things. Yep bro; we have all been there. When you focus most of your energies on having fun and spreading love, you worry less about getting anything, like traffic or profits. Your giving expands, so the getting (traffic, income) gets easier and easier, as the getting expands as well. Great post! I think if you do what you love doing, no matter what, you get success anyhow. It is just the matter of time. Exactly. Because if you are having fun, you are aligned with having fun….and as the fun expands you will become more successful. Good to see you here as guest of our common friend Enstine. You blew up my mind with your words “if blogging is fun for you then fun is your reward…….. I have shared it on Facebook with my views on it and highly appreciate how wonderfully you dealt with the topic and revived my dormant memories of those days when I was about to quit. But standing against odds was the only option I had and I well adopted it to comeback from despair and since then never looked back. Good to see you here on Enstine blog. And thanks for sharing the informative post with us. I have an entertainment blog, and have quite good traffic and have high bounce rate also which is above 80%. I hope this article will help me to increase some traffic to my blog as well as decrease some bounce rate. The thing that gets me every time is consistency. I do really well for a couple of months blogging every week. Traffic starts to pick up, social media involvement picks up, then I miss a week for some reason and it will be 2-3 months before I blog again. I lose all of the momentum that I had and have to start over from scratch again. I need to figure out how to keep consistent even when life gets busy. Like any perceived setback, the origin resides in our energy. A fear tension builds after you miss 1 week, then grows as you miss successive weeks. Take the pressure – and fear – off of yourself to post weekly. If you miss 1 week, no problem. Just post when it feels really, really fun to you. Usually, this will be after 2 weeks, tops, because we always seek out what feels fun. If posting does not feel fun to you…..time to blog on a new niche….or maybe, to give up blogging, to devote all of your energies to what makes you feel alive. First I want to say thanks ! And second, already learnt my lesson after reading this, “you cannot do everything on your own”, Below my question. I started on Blogger.com just for keeping logs, back then writing articles was so easy for me. After understanding the potential of earning while learning, I moved to self hosted wordpress and started writing detailed “How To” guides on Linux and electronics. But now writing an article is damn tough for me, increasing day by day. Perhaps putting unnecessary tress on somewhere, I don’t know where. May be quality, accuracy, spelling and grammar. How to over come that ? Hope I’m not too late to get reply from Ryan. Could be a few factors bro. How frequently do you post? May want to cut back on posting frequency. At its core, the reason is a mental block. Fear feeds that mental block. And fears about the quality, accuracy and grammar of your work can feed into that mental block, big time. Write mainly for fun. Really…..writing for fun dissolves the fear. Which dissolves the mental block. Which dissolves the feeling that writing is tough. Taking it easy…..yep….perfect example for me today, in this regard. I am super tired after being out late last night. So I wrote a post this morning, responded to a few comments and will rest until later today. Gotta chill to dissolve mental blocks and tension. I am following your blog from last few days, seriously your site is the best for SEO tutorial. From the beginning of the blogging, I followed your blog. I think initially its always fund to build a blog. But gradually when the traffic is not increasing and also no comments are coming regularly, things started moving different way. I think one should be interactive enough in social media and keep sharing ideas to get engaged. Thanks for the helpful add. Nothing will happen overnight. To be successful, we need to invest our time to identify the areas that need improvement and slowly raise our standards. Being persistence is a big factor that determines success in blogging. Enjoy the journey, interact with people, and help others slowly we will be able to see the traction. The secret to fun blogging really is patience. You summed it up bro. Enjoy, make friends and be of service. You will rock it out. What an educative article. It’s all about preparing your mind for the tougher days because it is imminent. Once the setbacks come, take it as a stepping stone to the next upper level. Hi Ryan, the blogging journey can be lonely. At times I feel like giving up but your article has given me inspiration to press on. From now on, am going to blog with love. Am not going to bothered about lack of comments, traffic and money. I will focus on giving value and being innovative. Great simple words right there, if that makes any sense 🙂 I think it’s easy to forget why you started to blog anyway, when you see all the money that probloggers are making. It’s easy to forget that ‘WHY’ and become almost obsessed with the dollars. Thanks for these great thoughts. We all lose our way – some just slightly – along with journey 😉 Then we shift to having fun and spreading love to right our blogging ship. Interesting Post, but I believe that if we follow what we love, there are very rare chances of failure or we can at-least rise again, if we face failure, that’s what I believe and I follow the same path. By the way, nice to see you here Ryan. Yes that’s it Jelina, that’s excellent. Follow your love, the chances of failure drop off, big time. Last Year, I have gone to Chiang Mai! Really, this is an excellent post! And I think if you do what you love doing, no matter what, you get success anyhow.So am I. So cool Nick. We love it here in Chiang Mai. So much to do so little time. Hi Ryan, I love how you insist on loving what you do. This is especially important in blogging as the setbacks are many. I am a beginner and I have felt like giving up many times. Thanks. Keep on keeping on Lovet, you will get there. Blogging setback is what every blogger faces at some point in his blogging career. However, what really matters is how you handle it. To some people, this is enough to make them quit and forget their dreams. But if you’re truly committed to making money from blogging, and living the life of your dreams then, you will always find a way to motivate yourself into pushing forward, knowing that every good thing takes time, and effort. Like Glen from viper chill said some time ago in one of his blog posts, the best thing is to always keep a picture of the things that motivates you. You can stick these pictures on any strategic place in your office where you can always see it this way; you will always triumph over every setback. Good stuff Ryan, thanks for sharing. Really very informative post on blogging setbacks! Loved this post very much! As a newbie blogger i have to learn more in every moment in my life. I believe learning has no ending point. The more you learn the more you can progress in your life. And keep sharing the knowledge you acquired! Anyway, thanks for sharing an awesome post!